Longtime Apple manufacturing partner Foxconn is currently testing a new, large-format iPad with the purportedly king-sized device slated to debut next spring, according to a new report out of Mainland China. 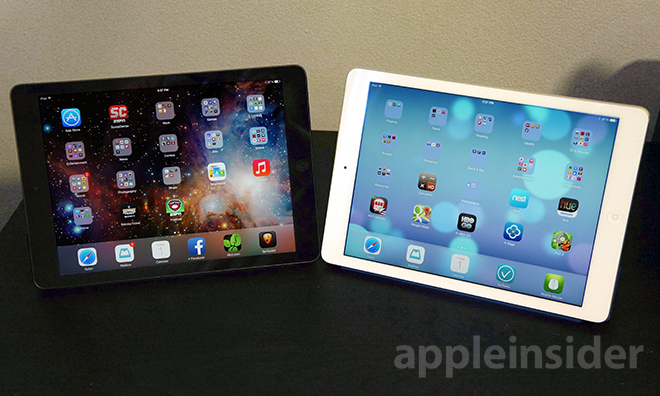 Many believe the new iPad Air could be joined by a larger-screened sibling as soon as next year. The tablet would sport a display diagonal of either 11.4 or 12.9 inches and is in an advanced stage of testing, according to Chinese tablet news site PadNews. The site says Apple could be targeting a March 2014 unveiling. Rumors and predictions have been swirling around what many journalists have dubbed the "iPad maxi" for months. In July, the normally reliable Wall Street Journal got into the game, saying that sources indicated to the paper that Apple has prototyped a new category of iPad with a display "slightly less than 13 inches diagonally." The Journal's report was followed in September by word from a different Chinese publication that Apple had a 12-inch iPad in the works with another old collaborator, Quanta Computer. Among others, Quanta has had a hand in manufacturing iPods and recent MacBook Air units for Apple. Analysts also expect to see a scaled-up iPad. Following the unveiling of the 64-bit A7 chip in the iPhone 5s, Barclays Capital's Ben A. Reitzes made the case for a 13-inch iPad with a convertible clamshell form factor, saying that considerations for such a device may have spurred the seemingly early shift to a 64-bit architecture for iOS devices.